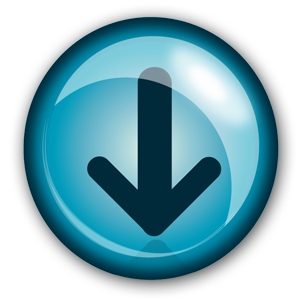 In the future you will be automatically redirected to the new website, but for now you can stay at the old website. If you would like to proceed to the new website, you can click the above link. The Portable Data-Parallel Visualization and Analysis Library (also referred to as PISTON) is a cross-platform software library providing frequently used operations for scientific visualization and analysis. The algorithms for these operations are specified in a data-parallel way. By using nVidia's freely downloadable Thrust library and our own tools, we can generate executable codes for different acceleration hardware architectures (GPUs and multi-core CPUs) from a single version of source code. The library is designed to be extensible and is intended to be integrated into other visualization applications. View these slides or this technical report for a brief overview of PISTON. The initial beta release of the code is available here. Some sample data that can be used with it is available here. 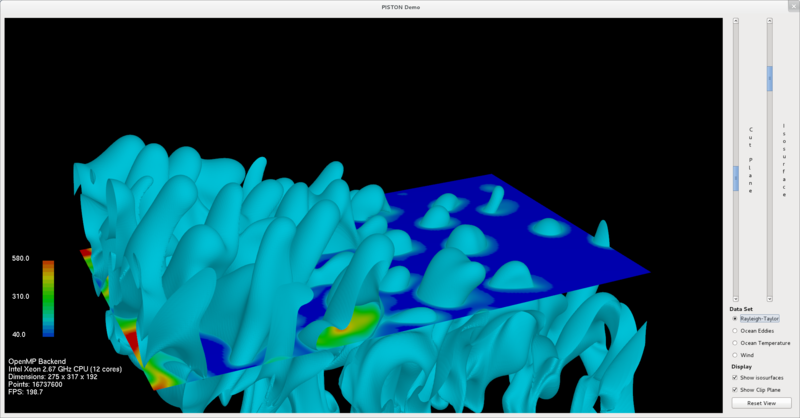 View the videos linked below to see our isosurface, cut plane, and threshold operators interacting in real-time with several scientific data sets, compiling to three different backends using PISTON. The code for the operators compiled for the CUDA and OpenMP backends is exactly the same, and uses nVidia's Thrust library. 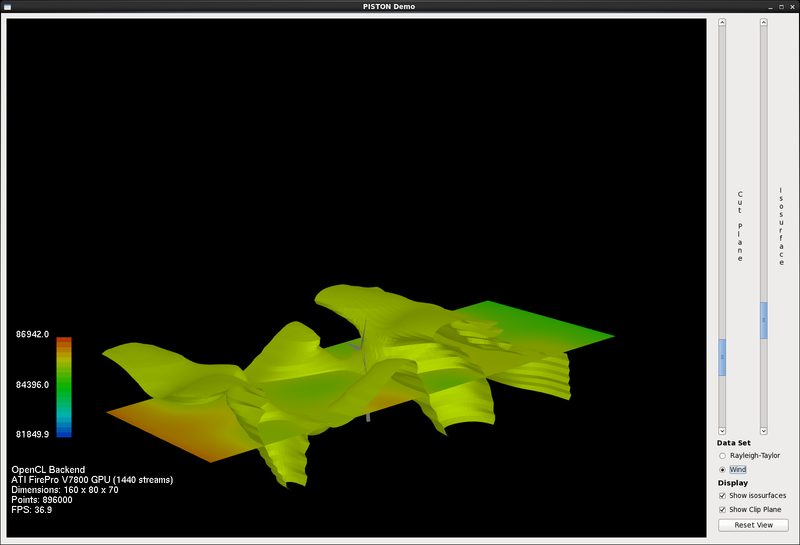 As Thrust does not currently support OpenCL, we are developing our own OpenCL backend. It compiles code for the operators that is almost (but not yet exactly) the same as that for the other two backends; ongoing work will more completely integrate these backends. 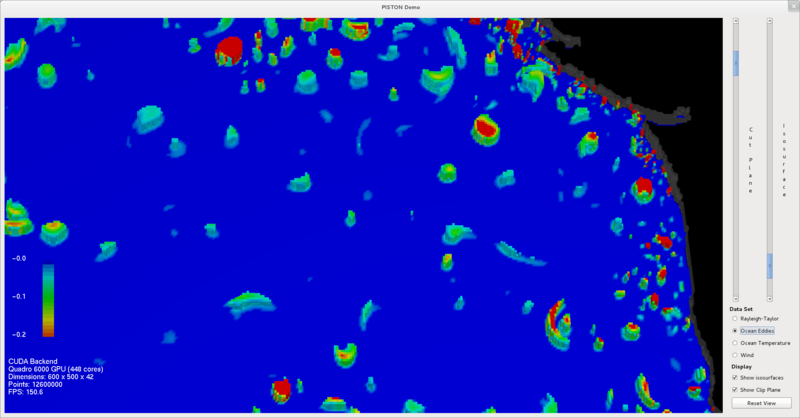 The image above shows ocean eddy data for the North Pacific using our threshold and cut plane operators compiled to a CUDA backend. Click here for a lower-resolution version of the movie. 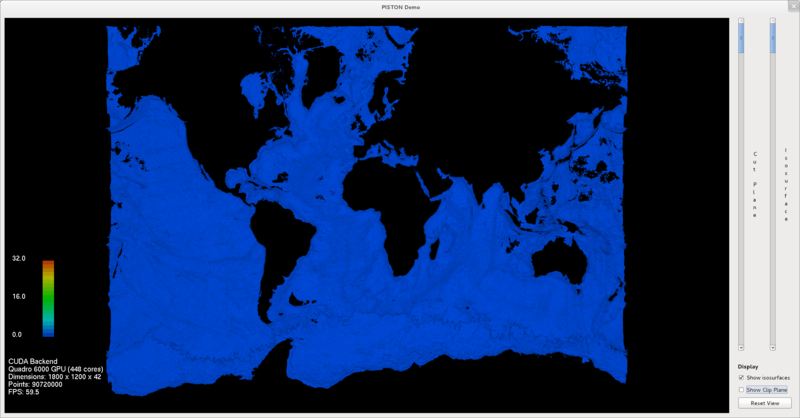 The image above shows a large (1200x1800x42) ocean temperature data set using our isosurface operator compiled to a CUDA backend. Click here for a lower-resolution version of the movie. The image above shows Rayleigh-Taylor Instability data using our isosurface and cut plane operators compiled to an OpenMP backend. Click here for a lower-resolution version of the movie. The image above shows air pressure data around a wind turbine using our isosurface and cut plane operators compiled to an OpenCL backend. Click here for a lower-resolution version of the movie.